Please click to view directions to our school. 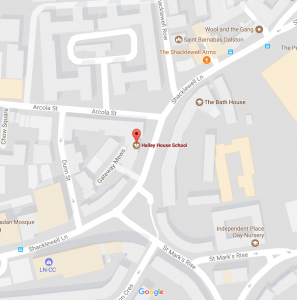 Halley House School is just a short walk (5-10 mins) from Dalston Kingsland train station with links to the London Overground. Dalston Junction & Hackney Central are also close to our school. Frequent bus services run near our school, click here for bus links. We would encourage our children to walk to school or take public transport where possible. There are public car parks around Dalston, and there is one in the Kingsland Shopping Centre for those who require parking. Entrance to our school is wheelchair friendly and we have a lift that runs throughout our school.